I’m back from the land of Thai! Lots of food photos coming soon, if you’re interested. It was a much needed break from everything, but it’s time to get this thing rolling again. Today I was really craving some tasty Mexican food, which led me out to El Azteca on Foothills. I had remembered hearing good things about them. Unfortunately, I learned that they are closed on Mondays. Instead I headed up Foothills and down Cirby to Sunrise where I stopped at the next taqueria that popped into my head, La Familia Taqueria. A reader told me about this one some time ago. Somehow I had missed it in my first and later passes through Roseville to create and maintain my list. It’s a little family owned/operated place located in the Rite Aid shopping center, almost hidden behind the Circle K (strange things are not afoot at this one). I arrived at about 5PM and headed in. There was a group of four finishing up, otherwise I had the place to myself. It’s a medium sized square dining room with about 10 or so tables and a big screen TV (which was showing the local news). Back in the right corner is the register and menu. I headed over to it and a man came out to greet me just before I got there. 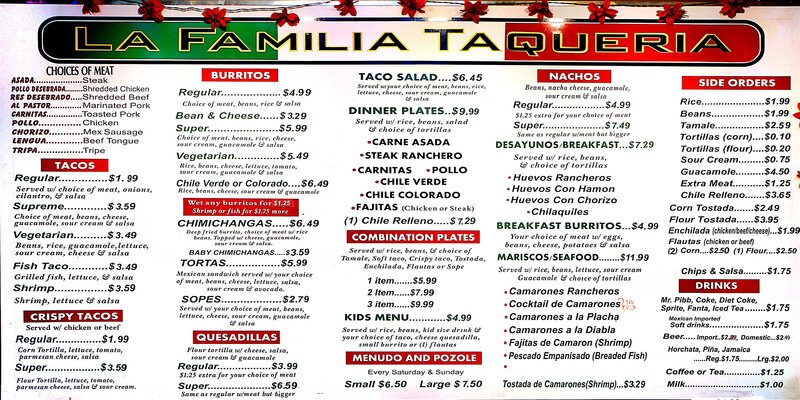 I skimmed the menu which looked fairly typical, although they have a few things that I’ve only seen here and there such as lengua and tripa. I ordered my usual carnitas plate with corn tortillas and asked for some sour cream & guacamole, since the menu didn’t mention them. He told me that it comes with both, so that’s a plus. For a drink I glanced around and saw a small soda fountain to my right, horchata was on the counter (along with two other drinks that cycle in the same kind of unit side by side which I’ve never tried before), and some beer / Jarritos bottles were on display near that. After a quick battle in my mind, I went with a horchata over the Jarritos. The total for the carnitas plate and horchata was about $13, which is about right compared to others in the area. I sat down near the front, for some extra light, and less than a minute later a basket of chips and a bowl of salsa were brought out. The chips were OK, but nothing too memorable. At first I liked the salsa, it seemed to have good flavor, but as I ate more I started to change my mind and decided it tasted a little too much like hot sauce than a well balanced salsa. It was very thin and runny. My horchata was pretty good. It was light on cinnamon, which I think helped keep it refreshing for longer. Normally I’d be sick of one by the end, but I got a refill of this for the road and am still happily sipping it as I type this out. My food took less than 5 minutes to prepare and be delivered to me. It was a good sized plate almost perfectly divided into quadrants: carnitas, rice, beans and the rest (lettuce, sour cream, guacamole and pico de gallo). The beans and carnitas were steaming a bit when it arrived. Indeed, the beans were probably the hottest thing on the plate, and they were very good. Add La Familia to the very small list of places that have notable beans. The rice was a bit warm but not hot, and also not that special. I mixed the rice and the crisp lettuce up with the beans for some extra texture. It was a good mix and I ate every last bite. The sour cream was nice and cool. The guacamole was disappointing, a bit runny and somewhat bland. At first glance I was a little concerned that the carnitas looked a bit on the dry side. This was because all the crispy parts were facing up. Just below the surface were some fantastically tender and juicy pieces of the slow cooked pork packed with wonderful flavor. There was just the right amount of fat scattered about the serving, often crispy on one side. I was generally happy overall with the refreshing horchata, fantastic carnitas and tasty beans. The shortcomings of the chips, rice and guac were overshadowed by these things. I was happy with the service as well. The guy came out to see if I wanted and more chips or salsa at one point. We didn’t have a ton of interaction though from the little we did he seemed nice enough. I think it’s a good taqueria that deserves consideration when deciding on Mexican food, for sure.